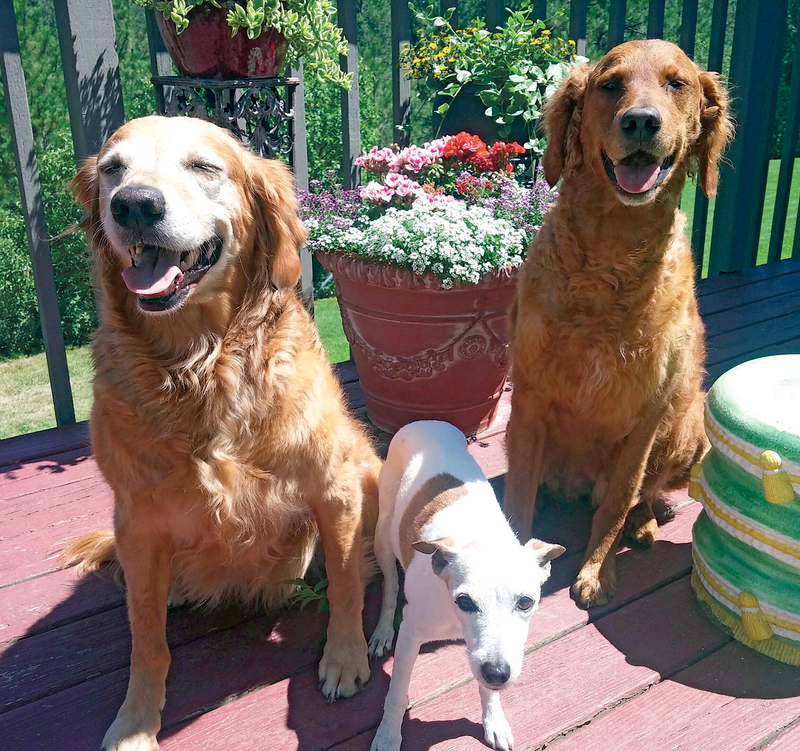 When Deb Lynam’s golden retriever Benny suffered a major medical episode, she initially sought out traditional veterinary medicine. Unfortunately, she concluded that the recommendation she received could have harmed or even killed him. Two years ago Benny had a massive seizure. Lynam brought Benny back to the Spokane-area home also shared by Flinn, another golden retriever, and Twosie, a Jack Russell terrier. Then Benny had two more seizures. As a nursing assistant at St. Luke’s Rehabilitation’s brain injury unit, she knew that side effects of barbiturates could include stupor, loss of coordination, instability, irritability, and even death, at least in human. Her son suggested cannabis oil, she never had considered for pets. CBD hemp oil is typically made from low-THC hemp. THC is the molecular compound that causes mental and physical reactions associated with general marijuana use, while CBD is another natural compound that provides pain relief. Lynam now spends about $50 a month on treats for Benny, including CBD oils that she drizzles over his food, along with Canna-Pet, a brand of flavored organic biscuits suggested for dogs. She finds some items online and at Sativa Sisters, a Spokane retailer. Now, Benny isn’t the only pet to benefit from them. During the 2016 Nestlé Purina Companion Animal Nutrition Summit, veterinarian Susan Wynn of BluePearly Georgia Veterinary Specialists’ Nutrition and Integrative Medicine Department, discussed therapeutic intervention and the use of cannabis on companion animals. Wynn told attendees that although veterinarians cannot recommend cannabis, they can advise on toxicity, since dogs have more brain receptors for cannabis than humans, which makes them especially sensitive. Similar conflicts in providing advice are seen at Washington State University’s College of Veterinary Medicine, where due to federal funding, cannabis is considered an illicit substance so can’t be researched for possible medical use in pets. But toxicity can be discussed. Currently, most pet products containing CBD are not regulated, something the U.S. Food and Drug Administration finds troubling. In letters sent to companies selling CBD products for pets in 2015, the FDA expressed concerns about marketing messages and labeling that claimed the products help pets with asthma, cancer, chronic pain, dementia, seizures and other maladies. This uncertainty over verbiage and effectiveness also caused the FDA to caution owners about using any cannabis products for pets, without first talking to their vet about other treatment options. Despite the FDA’s lack of guidance, many pet experts report nothing but success in CBD oil treatments. One of those experts is Montana-based Nancy Tanner, certified professional dog trainer, and owner of Paws and People. She has several clients who give products to their dogs for anxiety. For dogs under 20 pounds, and especially picky eaters, CBD is available in small tablets containing powder in clear vegetarian capsules. Bigger dogs can have oils mixed into food, or dog treats such as Canna-Pet. “It’s not a sedative. It allows a dog to take a deep breath and reset,” she added, noting that it also helps dogs suffering from past trauma, but not necessarily specific events such as thunderstorms or fireworks. Though some pooch owners say dogs can benefit from cannabis, cats may not be as receptive. “While oils like lavender and chamomile work for dogs, they are toxic for cats,” said Nancy Tanner, certified professional dog trainer and owner of Paws and People. “Felines and canines are built differently. Humans and dogs, however, have similar receptors and are receptive to CBD as a medicinal plant.” With the exception of a few Canna-Pet products especially for cats, most pet products are intended for dogs only. Published: July 28, 2017, 10:44 a.m.